5% earnings growth isn't going to satisfy Wall Steet when it has given WD-40 such a premium valuation. Check out the latest WD-40 Company earnings call transcript. 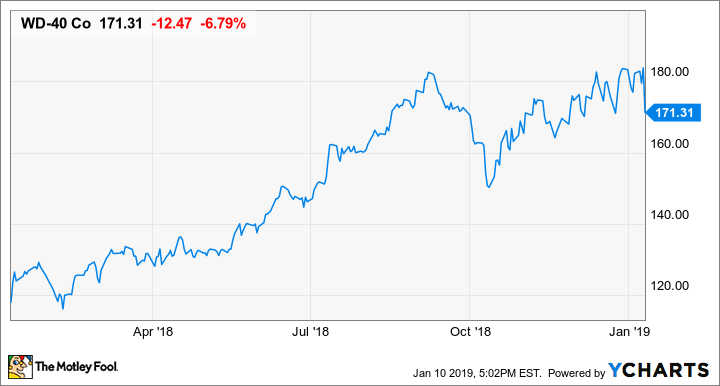 Even though WD-40 Company (NASDAQ:WDFC) beat revenue estimates and hit analyst earnings targets for the quarter, the company's stock declined 7% the day after it announced Q1 2019 results. That isn't a great start for investors hoping for a repeat performance of last year. Based on these results, what management is projecting for the next several years, and how the stock is priced today, a stock price decline isn't that absurd. Let's take a look at the company's most recent results and why investors may be leaving this stock despite its meeting expectations. DATA SOURCE: WD-40 COMPANY EARNINGS RELEASE. EPS = EARNINGS PER SHARE. This past quarter was tangible evidence that the corporate tax cuts are having a direct benefit on a company's bottom line. Even though WD-40's operating income was down slightly compared to this time last year, net income was up 4.7%. The company was able to juice its earnings-per-share result a little higher thanks to management's regular share repurchases. Over the past decade, the company has reduced its share count by 16.6% with consistent buybacks. Sales this past quarter were more or less in line with what investors should expect long term for this company. Even though WD-40 faced some sales headwinds in its Asia-Pacific region, as well as continued declines from its homecare and cleaning products, it was able to more than offset those losses with strong growth in its Europe/Middle East/Africa region and its specialty product business. The thing that investors should watch in the coming quarters is the company's costs. Gross margins slipped 0.4 percentage points to 55.1%, and its sales, general, and administrative costs ticked up to 32.3% of revenue. Management has said repeatedly as part of its 55/30/25 plan -- 55% gross margin, 30% cost of doing business, 25% EBITDA margin -- that it needs to keep costs in check. That uptick could be a result of bringing its research and development work in-house with a new laboratory and a short-term increase. It will be worth keeping track of in future quarters, though. With sales growth in the mid-single-digit range, the company can't really afford for its operating costs to eat into margins. [W]e have not updated our guidance to reflect today's lower crude oil prices because we have not yet determined if crude oil at less than $65 a barrel is an event or a trend. Additionally, it's important to clarify that even though petroleum-based specialty chemicals make up a significant portion, approximately 35% of the input costs associated with the can of the WD-40 Multi-Use Product, only a small portion of that is directly tied to the cost of crude oil. This is because we do not buy crude oil, we buy custom-formulated specialty chemicals, which have complex cost drivers, including manufacturing region, fixed product costs and distinctive supply and demand characteristics. You can read a full transcript of WD-40's quarterly conference call here. It's hard to say exactly why Wall Street didn't like these results, but one thing was apparent before this most recent earnings report: WD-40's stock was priced for perfection. It's hard to justify buying any business, no matter how good, that grows sales at a rate of 4% to 7% annually for 36 times earnings. From a business perspective, this quarterly earnings report doesn't really change the investment thesis on the company. It's highly likely that it will be a slow-growing business that can supplement investor returns with dividends and share repurchases. Anyone owning shares shouldn't be concerned with these results. For those looking at this stock as a potential buy, though, the stock simply looks too pricey. It's probably best to wait for a better entry point down the road.